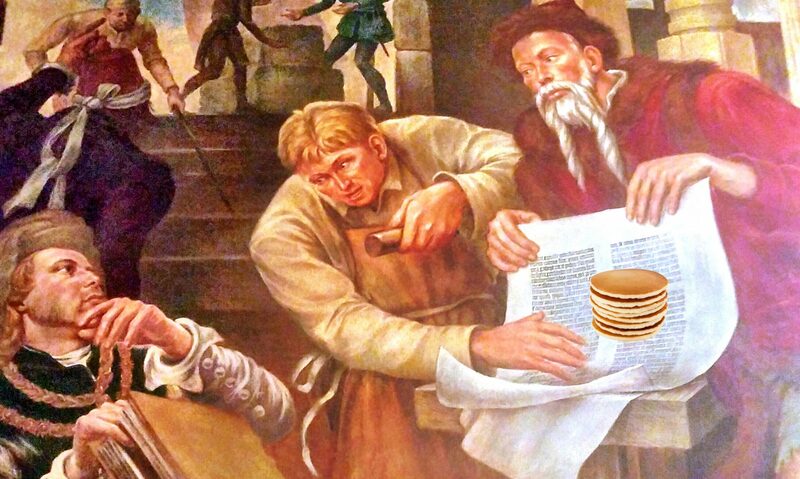 What is the Supreme Pancake? It had only been about a month since he first appeared by his side, but it felt like he’d been there for years, or even his whole life. …and made no gesture, save that smile. Every day, nothing but that horrible mocking rictus. He couldn’t go anywhere else, he couldn’t try to leave, for he’d just follow him to the next place. At times he seemed to him a perverse mirror, a reflection of all his evil deeds in life come back to haunt him, a promise that the worst of him would forever be by his side. Oh, he could always face away from him, and that helped from time to time. But it was only a temporary balm against his tormentor. In fact, sometimes it was even harder to bear, that even though he couldn’t see him, he knew he was still there, doing everything he was doing, perhaps even thinking everything he thought. His afternoon naps were no comfort either. Did he suffer the same nightmares as he? He had one where he was in a comfortable bed, and he could feel his faint heartbeat thumping with his head on a soft down pillow. But then he realized his head was laying not on a pillow, but on the hatch to a cellar, and it was not his heartbeat that he heard, but the footsteps of the horrible man beside him, slowly walking up the stairs to open the hatch door and deliver his reckoning, all with that same smile. Here was another: his old spiritual father had just heard his confession, and he had finished laying all his good and bad deeds bare. There was only one step left to achieve his final absolution: the padre strapped him to a table, raised the ceremonial knife in the air, and cut open his belly. Out of the gash in his stomach stepped none other than the smiling man!, and while he gasped and screamed while trying to keep his guts inside him, he simply stood over him and watched, and smiled. What kind of a man was he? Who would deliberately surrender his own will in the service of perfectly mimicking another will without fail? Who indeed, but one with only pure malice in his heart, only the will to drive another mad and utterly destroy him. Whatever it was, he knew this had gone on long enough. Let’s see then, he asked himself, if he indeed mimics my every move, my every intent for good or ill. So he does. He gained a valuable, albeit painful, bit of intelligence against his foe. The mysterious man truly was a slave to the will of another. Though it was undeniable he kept up the act with a will to do harm. yet he had no choice but to copy the actions of his companions whether it did him good or harm in return. Even… the ultimate harm. Perhaps that was the only way he could end this perverse charade once and for all. Dare he do it, then? Take the plunge, end his life once and for all? There had been so many other chances he didn’t take, with what dreams may come always giving him pause. But life as bad as it was, with him constantly by his side? Maybe this was too much. Maybe he could, if it meant he might take his own life too. If he buried just his head in the sand, and kept it there as long as he could, maybe it could finish the job. Or… maybe he didn’t have to shuffle off this mortal coil after all. What if he just left his head in there as long as his lungs would allow? Maybe this smiling fiend has a smaller lung capacity, maybe what he could survive would kill him instead. Maybe he’d snap his head out of the sand, gasping for air, and be greeted with the sight of his tormentor’ dead and his head stuck in the ground forever. But he would have to be sure. If there was only a way he could see from under the sand his chest stop rising up and down, or hear his heart slowly stop beating. What if he failed? There’d he be, on his knees and facing him once again, face covered in sand and smiling at him nonetheless. But there was no turning back now. A little discomfort was preferable to a lifetime of him, smiling and smiling forever. It was black for a while, and of course the smell and taste of wet sand at first. But as he started to run out of air, and his consciousness slowly slipped away from him, he almost believed as if he was peering through a hole into hell itself. There was of course his smiling friend, always by his side, applying the rack, flaying his skin off with the cat o’ nine tails, applying hot coals to his exposed flesh, and sprinkling it all off with plenty of salt. But there were also all his old friends, all his distant family, everyone in life he knew and wronged, and they all just stood there, and frowned at him, and said nothing. It was as if he had lived his whole life for nothing, brought joy to no one he knew, made nothing in the world better before leaving it. He realized then that the smiling man was all he had left. At least he was thoughtful enough to give him a smile. Very well then, he thought as he dragged his flayed bloody salt-ridden flesh back to his only friend, and asked him very politely if he could have another. …and as for him, he hoped his new friend would pull himself out of the sand soon, before he ran out of air for good. True, he was the best copycatter on the whole island, but what good would that talent do him if every friend he made kept on killing themselves over it?